Discussion "Independent Homepage" ?? Clues ? "Independent Homepage" ?? Clues ? When clicking around the "customise" screen I came across an option to select "independent homepage". No amount of searching in the support pages and this forum has found me a definition of what exactly it is and how it is used. Trying to establish it it is something that could be used for those of us who utilised Phanfares subsites feature. It just means that the homepage will NOT take the customizations from "Entire Site". For example, maybe I want a splash page with 2 buttons "Enter Site" and "Contact Me". Then when you enter the site, I'd have a navbar at the top, on all my pages (from Entire Site). Not sure what a splash page is but so i think you mean a page someone starts at when they find your site - and it just has two buttons - then enters the "real site" ? Still really struggling to find a solution for my subsites that need to be totally independent of my normal every day photosite. Its feeling like I will almost have to actually create multiple smugmug accounts and somehow get photos all transferred over to them or something. Is that something that is possible ? would I have to pay separate annual fees ? I'm trying to figure out the subsite thing, too. I have some ideas and I'm starting to implement them to see how they work. 1. Online backup of photos I care about. 2. Sharing photos with family, friends, school, church, neighbors, etc. I think that's a little different than @KarinaExPhanfare's use case. You say you need completely separate sites. In my case, I want to share different galleries with different people, but there's a lot of duplication (for example, I might share the same gallery with both family and friends). Main Repository folder. This is where I'm trying to upload all my photos. Kind of like the main Phanfare view you'd get when you log in. I'm creating year folders underneath that and then subfolders or galleries underneath that. Family folder. This is where I plan to share pictures with family members. Friends folder. This is where I plan to share pictures with friends. Public folder. This is where I put a few galleries that I share with whoever comes to the website. No password needed. I set this up on Phanfare and posted a handful of current family galleries there. I did this because I realized that some people just don't want to deal with passwords (or can't handle another password). Even though they could get an email from Phanfare with a clickthrough embedded password. I just wanted people to see something reasonably current if they stopped by. What I've found on SmugMug is that I must have public availability of my master photos (the non-collected photos). Without that, you can't show them elsewhere. So my Main Repository folder is set to Unlisted / anyone with a link (see my post about security through obscurity). Someone has to guess your URL to see your photos. Next, collect photos to another top-level folder that I want to show to a certain audience. For example, I put something in my Public folder and set the gallery permissions so anyone can see them. I just realized that even with "Show Camera Info" turned off that the pictures still show the EXIF tags. I'm not happy about that and took down my first public experimental gallery. Oh well, that's what I'm thinking as I eat lunch at work. It's not all panning out as I'd like and is time consuming. Looks like my lunch break is over, so I'll end this post for now. Yes so far I have set it up pretty similar. A "main" folder with all my annual year folders. A "family and friends" unlisted folder which I will eventually send them the password for - when I work all this stuff out. Some generic public folders for just random stuff I share with friends and strangers. With my subsites on phanfare I had some very specific ones that had no relation or connection with "me" and my online photo self. I run websites for a couple of actors/singers - so on their website I had a photos page with an inline frame in which the phanfare subsite lived - filled with publicity photos etc - a pretty sizeable archive of their 4 decade long careers. I also have a few other websites of different natures where I was using the same set up. I dont want those folder of photos on my own personal photo page. They are a separate "entity" to me. The phanfare subsite set up worked well because I simply ticked that magic box showing where I wanted the photo album/site to be viewed - and I selected its own domain. Not my own main site. So for now I am at a total loss as to what to do. And its affecting the websites I run - they all have regular viewers/visitors and all they are seeing at the moment is the dead phanfare page. I never realized that a Phanfare subsite could have its own domain. I never had reason to set up my own domain. Now I realize why you were asking if you have to set up multiple SmugMug accounts. You might be able to put one of your SmugMug folders an an iframe on those other websites. I'm not a networking expert, but I think you'd have to get DNS records published so browsers don't reject the embedded iframe. Of course, if people looked at the page source, they'd still see your SmugMug account referenced, which you probably don't want. Your question on the splash page is an example of what can be done with an independent home page. One smugmug account is a single domain. There isn't support for multiple domains within one account. It is possible to forward another domain to your primary domain but that wouldn't accomplish what you are after since the forwarding needs to be to the primary domain (at the top level). See help page http://help.smugmug.com/customer/en/portal/articles/90209-using-multiple-domains. If you choose to use multiple smugmug accounts the support heroes can transfer photos from one site to the other for you. You can contact the support heroes at http://help.smugmug.com/customer/portal/emails/new. I just realized that even with "Show Camera Info" turned off that the pictures still show the EXIF tags. I'm not happy about that and took down my first public experimental gallery. Just a clarification: the photos aren't showing the EXIF information when i suppress it; they're showing the keywords. EXIF doesn't store that metadata; it's in IPTC/XMP metadata in the photo. You can hide the keywords from showing in SmugMug style galleries and in the lightbox by using the CSS found in the thread How do I hide keywords? There are two pieces of CSS that you will need, one for each location. Note that your viewers will still be able to see your keywords on your http://YourSiteURL/keywords page. You can see a list of the system pages on the help page at http://help.smugmug.com/customer/portal/articles/1210637-how-do-i-create-and-customize-pages-. > Yes so far I have set it up pretty similar. > A "main" folder with all my annual year folders. > A "family and friends" unlisted folder which I will eventually send them the password for - when I work all this stuff out. > Some generic public folders for just random stuff I share with friends and strangers. > With my subsites on phanfare I had some very specific ones that had no relation or connection with "me" and my online photo self. > I run websites for a couple of actors/singers - so on their website I had a photos page with an inline frame in which the phanfare subsite lived - filled with publicity photos etc - a pretty sizeable archive of their 4 decade long careers. I also have a few other websites of different natures where I was using the same set up. > I dont want those folder of photos on my own personal photo page. They are a separate "entity" to me. > The phanfare subsite set up worked well because I simply ticked that magic box showing where I wanted the photo album/site to be viewed - and I selected its own domain. Not my own main site. > So for now I am at a total loss as to what to do. And its affecting the websites I run - they all have regular viewers/visitors and all they are seeing at the moment is the dead phanfare page. I don't know if this helps, but you don't have to show all your Smugmug folders and galleries on your Smugmug homepage - you can keep some "invisible" on your homepage. You can go to your Smugmug homepage and click on "Customize" and then click on "Content and Design," and then for each content block, you can change around what you'd like in that content block, and add/remove folders and galleries from each content block, and even remove content blocks. And remember that each folder and each gallery can have its own password (or not). I have been having a play with content blocks but when I click on a folder to work on - all the galleries are in a single content block. I was initially trying to work out how to separate some galleries visually - put a border between "types" - but with everything in a block already I couldnt really work out how to move galleries out of that block into another one. And that seems to also be what I would need to do based on your description if I wanted to make a couple that are specifically separate to me "invisible" on my home page (which would be ideal). Are you able to elaborate where I go to actually add/remove galleries from each content block ? I am clicking around but the only option I can see is every gallery inside one content block. So I think I am missing seeing something in the menus. (and also once I achieve that on my homepage - how do I make the relevant ones invisible on the homepage - but still open to the public where I will be linking to them from other websites). I have been reading practically every tutorial and watching all the videos but there is very definitely a lot of implied knowledge within them. For someone starting from scratch following a migration - its so baffling. I'm assuming you selected Customize / Content and Design? When I do that, I see a menu on the right side where I can choose content blocks and add them to my home page by dragging. If you click on the wrench icon on the upper-left of each content block you get a menu of choices. You can choose the gallery there. Here's an example using a Folders, Galleries, & Pages content block. You can see this example on the Kaleidoscope page on my site. The top block on that page is a Folders, Galleries & Pages block. Right now I have selected only galleries. I selected "Items I choose", then used the Items entry to select the galleries. If you are using a galleries content box, select "Galleries I choose", then select the desired galleries. To remove galleries, open the gallery selection, open the folder in which the selected galleries reside, and deselect them. > I have been having a play with content blocks but when I click on a folder to work on - all the galleries are in a single content block. I was initially trying to work out how to separate some galleries visually - put a border between "types" - but with everything in a block already I couldnt really work out how to move galleries out of that block into another one. > And that seems to also be what I would need to do based on your description if I wanted to make a couple that are specifically separate to me "invisible" on my home page (which would be ideal). > Are you able to elaborate where I go to actually add/remove galleries from each content block ? I am clicking around but the only option I can see is every gallery inside one content block. So I think I am missing seeing something in the menus. (and also once I achieve that on my homepage - how do I make the relevant ones invisible on the homepage - but still open to the public where I will be linking to them from other websites). > I have been reading practically every tutorial and watching all the videos but there is very definitely a lot of implied knowledge within them. For someone starting from scratch following a migration - its so baffling. I'll just talk about the steps I take. So, I am at my smugmug home page, and I click on "Customize" at the top of the page, then "Content and Design," then I go to "Add Content Block," and I drag "Folders, Galleries & Pages" onto my page. That block will be pre-populated with just about all your top-level folders and galleries you have in your smugmug account. But, let's say you don't want all your folders and galleries in that content block. So, on the top of that content block, I click on the wrench symbol. Where it says "Select From," instead of choosing "Current Location," I am instead going to click on "Items I Choose." Now, you have the freedom to choose any gallery or any folder to put in that content block. (If you have a Power or higher account, you can also include Pages in your content blocks as well.) 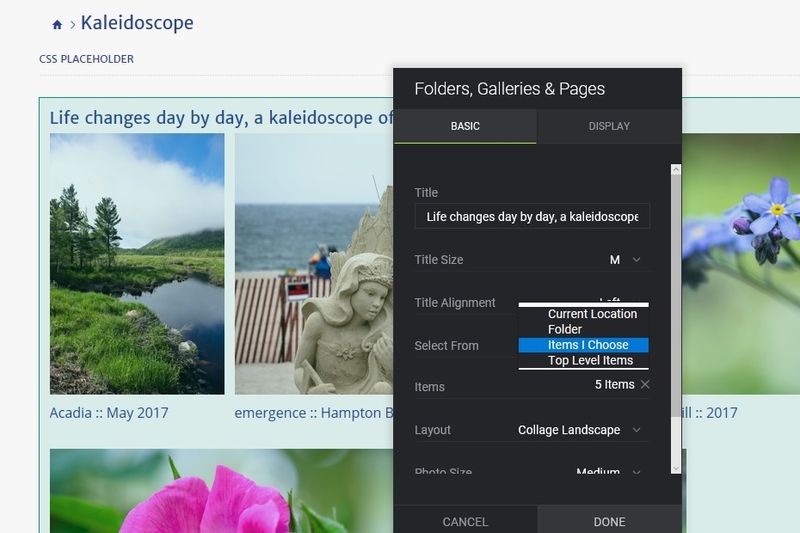 The folders and galleries (and pages) that you choose to include in each content block do not need to be from the same folder. You can have items from several different folders in the same content block -- just click on the breadcrumb trail on the top to navigate around your site. Note you can also put any title on any content block and lots of other customization options as well after clicking on that wrench symbol. Remember, if any folder or gallery is not on your home page, you can always view them by clicking on "Organize" on the top of your site. I have lots of folder and galleries that are just for me and my family. They cannot be found on our home page. We can see them any time by going to the Organizer. Ohhhh ok - I assumed that initial content block was "cement" so to speak and that the galleries visible in it where what I was stuck with. So I can actually put a series of content blocks (with dividers between them) and split my galleries up. (Yes I am a Power user so I have pages - have been playing with creating them last night to replace what were my journal pages in phanfare and so far they are coming along nicely). With my main "folder" that I have put all the family and friends type stuff that will be unlisted and available only to them via the link - I had created all my "annual year" folders similar to what I had with Phanfare - but I wanted to pretty it up dividing it into actual decades, and with a few random galleries up the top. So that makes sense now the way you have described doing it by choosing what goes into each content block and titling it! You're welcome! You know, it took me a long time to realize that I wasn't stuck with the items pre-populated in a new content block (maybe because I was so used to using Phanfare for so many years). And, just a couple months ago, I realized that the items in a content block could be from different folders, LOL! Here are some good tips from smugmug on creating a blog/journal (https://school.smugmug.com/SmugMug-Tips/How-to-Make-a-Photo-Blog). By the way, I am currently on the basic plan, but I can achieve somewhat of a "journal/blog" presentation without pages. I set the gallery style to "Journal." For each photo, I type in the title. Next, for my journal/blog entries, I just type in (or copy and paste in) a really long caption - captions can be up to 65,000 characters long, according to the smugmug help section. Slowly getting the hang of it (after accidently forgetting to select "make this gallery custom" or "just this folder" and accidently putting a theme and headings across every single gallery - I am doing a lot of "redo" !). Have started building 'pages' to replace all the smugmug journal albums where I use to create lists and blogs. Next week will start on what you and Denise have explained above with moving galleries into blocks so I have a bit more specific organisation. Its all a learning curve! Very much appreciating all the help and tips here.